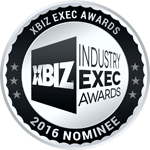 We are excited to announce that Lauren MacEwen, primary strategist of 7 Veils Media, has been nominated for the Marketing Executive of the Year 2016 Xbiz Award. Selection of nominees was based on a multitude of factors including leadership ability, business acumen, positive community influence and overall career success as submitted by industry peers via social network XBIZ.net. The XBIZ Exec Awards spotlight outstanding individuals who play a key role in the success of prominent brands. The award categories cover a range of occupations that make up the organizational chart of industry enterprises, covering business development, marketing, management, chief executives and more. To be held at Andaz Hotel on Hollywood’s famed Sunset Strip, the online industry edition of the XBIZ Exec Awards will be presented at an exclusive awards ceremony on the evening of Jan. 13 and the retail edition on Jan. 14. For the complete list of nominees, visit XBIZ.com.